“Who are we designing for?” That’s traditionally one of the first questions asked by L&D when starting a training project. Typically, there’s just one answer, and it sounds something like this: all managers, or IT employees using the XYZ program, or customer-facing employees. In other words, it’s a description of the one target audience. Once we have that single target learner group definition, we design one training solution to cover the needs of this monolithic target. This approach is not working for modern learners. Because modern learners work in an ever-changing environment and must use a wide range of resources to get the answers they need, they want and need L&D to offer customized learning. Rather than a one-size-fits-all e-learning course or face-to-face class, modern learners expect to be able to select, or even create, their own personal learning path—with ease, searchability, and accessibility. All modern learners do not want the same type of training. They are context-driven. All modern learners do not just want technology-driven training. They want any delivery medium that works for their needs. All modern learners do not belong in the Millennial generation. They come from all generations, with diverse backgrounds. Thanks to technology, L&D can offer multiple learning assets tailored to various groups of learners. For instance, one method is to provide smaller learning assets—bite-size chunks of online learning, how-to videos, or shorter classes bookended by self-study prerequisite learning and post-class learning tools. While this approach may be a step in the right direction, it still is not hitting the mark for most modern learners. L&D practitioners need to learn how to identify key subgroups within the larger target audience and then collect or create the right array of learning assets to meet the learning needs. What’s more, they must go beyond segmenting learner groups by the traditional criteria of age, experience, education, language, job role, and so forth. Instead, the future of L&D lies in building learner personas. In our Learning Cluster Design model for modernizing L&D (see LearnNow: Designing for the Modern Learner), an essential action is to uncover key learner-to-learner differences, and design learning assets that target their needs and preferences. How do their skills manifest in their job? Are they behind a desk? Are they expected to be highly relational? This positions us to understand what and how learning assets could mimic the job. What is day-to-day life like in their job? This positions us to make learning assets convenient and accessible. For example, designing a classroom training for manufacturing line employees who struggle with having off-the-floor time is not as effective as bite-size or just-in-time learning made available on the devices they use on the floor already. What is their culture? We need to make sure to include nuances for demographics. For example, maybe learners come from different regions that have different communication styles; in some regions, guidelines and frameworks for peer-to-peer coaching as a learning asset might be more effective than manager-employee coaching. What are their go-tos for learning? The table below can provide insights. When you need to learn something for work or home, what do you do? The best source for answers to these questions is the learners themselves and the people who most witness the learner’s new capabilities. Now, with a deeper understanding of the learner-to-learner differences, look for patterns and groupings. Find the most common three or four groupings. A description of each large group of learners forms your learner personas. It’s helpful to name these personas. One Fortune 100 beverage company does just that: They have identified dozens of standard learner personas, complete with names and detailed descriptions, that L&D uses across the board for learning design. Elena, the experienced manager has a cadre of peers whom she trusts to talk over managerial issues (social learning). Her plate is full with both managing her staff and her own personal work projects. She likes to learn in the moment on new computer technologies, and is interested in the big picture that will help her succeed when promoted to the next level. John the old-style manager has succeeded at getting the job done for a decade without complaint. He’s not interested in changing. He is willing to go to classes where he can share his stories and experiences with others during group activities. In the past, we might not have had an efficient way to tailor our offerings to different learning subgroups within our target audience. Today, we do, and the future of L&D depends on it. It’s our engine for providing relevant training that matters! Want to learn more? 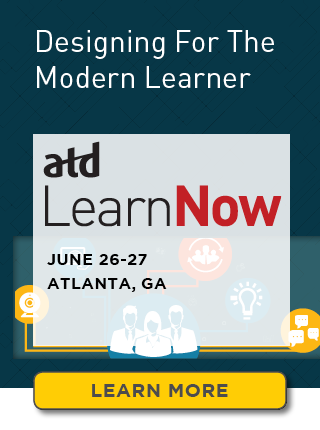 Join us for LearnNow: Designing for the Modern Learner. During this workshop, you'll apply a proprietary learning cluster overlays approach to modernize a short course from your workplace and design a learning cluster to meet a specific need in your workplace. Could your organization design multiple learning assets to meet differing learner needs? If not, what’s the barrier? If you’ve already done it, please share your story. How do you think learners will respond if given a choice on how to learn? Crystal Kadakia is a two-time TEDx speaker, author, and consultant on Millennials and the modern workplace. Her company, Invati Consulting, champions what she calls “talent-driven organization design” to modernize the workplace through speaking, training, and consulting solutions. Her mission is to enable organizations and talent to work together to revolutionize the workplace for today’s digital world. She reshapes the conversation on Millennials by providing a strong Millennial voice in a sea of Boomer and Gen X perspectives. She is the creator of the acclaimed virtual blended training program on generations, Generation University, and the Modern Culture Assessment, which drives organizations to strategically shift culture for the needs of modern employees. Crystal was named One to Watch by the Association for Talent Development and is a co-author of Your Career: How to Make It Happen. Before starting Invati Consulting, Crystal led multiple multimillion-dollar projects as a chemical engineer at Procter & Gamble. She transitioned successfully to training and development and led multiple global programs, including renewing the new hire technical university training program and standardizing onboarding globally. Today, she has given more than 50 talks and has influenced more than 1,000 leaders to shift their paradigm on the modern workplace. She is also a regular contributor to the Huffington Post and the Human Capital Institute. Lisa Owens is a learning expert who applies learning sciences to create training programs that move businesses forward. She designs training for the in-person and virtual classrooms and the web. Lisa founded Training Design Strategies LLC in 2012 to help companies achieve their goals through the power of training. Beyond her current client work, she is an instructor for Ohio University’s instructional design graduate program and on GC-ASTD’s Executive Advisory Board. She is co-author of the college textbook Your Career: How to Make It Happen, the books Leaders as Teachers Action Guide and Lo start-up di una Corporate University, and a series of articles for CorpU on creating corporate universities. Lisa holds a bachelor’s degree in chemical engineering and a master’s degree in education.